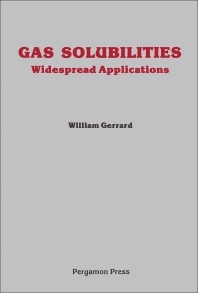 Gas Solubilities: Widespread Applications discusses several topics concerning the various applications of gas solubilities. The first chapter of the book reviews Henr's law, while the second chapter covers the effect of temperature on gas solubility. The third chapter discusses the various gases used by Horiuti, and the following chapters evaluate the data on sulfur dioxide, chlorine data, and solubility data for hydrogen sulfide. Chapter 7 concerns itself with solubility of radon, thoron, and actinon. Chapter 8 tackles the solubilities of diborane and the gaseous hydrides of groups IV, V, and VI of the periodic table. Chapter 9 discusses the solubility of gases containing fluorine, while Chapter 10 talks about Hildebrand's theory in the light of all gas solubility data. Chapter 11 covers the hydrogen halide system, while Chapter 12 deals with the solubility of gases in water and aqueous solutions of slats, inorganic acids and bases, and organic compounds. Chapter 13 discusses gases in sea water, while Chapter 14 covers aerosol propellants and Chapter 15 tackles the solubility of nitric oxide. Chapter 16 discusses the biotechnological aspects, and Chapter 17 talks about more on making holes. Chapter 18 covers the evaluation of data on phosphine. The book would be of great interest to researchers and professionals concerned with applications of the soluble nature of gases. 1.5. The Effect of the Vapor of Liquid S, the "Solvent"
2.1. The Concept of "Ideal Solubility"
2.2. Deviations from "Ideal Solubility"
3.2. Solubility Data: Gases of "Great Solubility"
3.3. Solubility of Gases at "Medium Solubility"
3.4. Gases of "Small Solubility"
11.6. Hydrogen Fluoride as a "Solvent"
17.5. Solubility of Nitric Oxide and "Henry's Law Constants"